This is a Louis Philippe Instant Gift Voucher (GV) and would be accepted at listed outlets (for outlet list visit www.gyftr.com/lp). 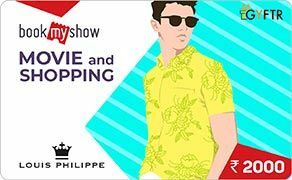 The person who has the Louis Philippe GV Code is deemed to be the beneficiary. Only the listed Louis Philippe outlets at its sole discretion accept the GV. Louis Philippe may add or remove an outlet without giving any prior notice. Louis Philippe Insta Gift Voucher CANNOT be revalidated once expired. Louis Philippe Insta Gift Voucher can be used during sale. Louis Philippe makes full efforts to accept Instant Gift Voucher, but on account of any technical / administrative reasons an outlet may refuse to accept the same. Please contact Louis Philippe Shop manager for any acceptance issue and if issue is still not resolved, you can write in to [email protected] or call 0 851000 4444 for immediate help.